Marketers are awash in data. But ask marketers if they’re measuring the right things and most answers are closer to “damned if I know” than “you betcha.” So, what can be done when big data gets the better of you? In May I judged a category in the 2018 Content Marketing Awards. I was particularly interested to see how the entries reported success metrics. I was beyond disappointed to see many entries relying on the same ubiquitous (and often useless) metrics everyone touts regardless of the nature of the content or the business goals it’s meant to achieve. Even when people clearly defined their goals for the project – and not everyone did – there was a striking disconnect between the goals and how they claimed to demonstrate success. Too many marketers mistakenly rely on the same metrics regardless of #content’s purpose, says @SarahMitchellOz. Rand Fishkin sees the same behavior. The founder of SparkToro and Moz, and author of Lost and Founder: A Painfully Honest Field Guide to the Startup World, has spent his career helping marketers reach their target audiences. Rand spoke to me about measurement on an episode of the Brand Newsroom podcast. “I think that one of the biggest issues I see on measurement and reporting, for sure, is that the marketing metrics we use are disconnected from the things that actually impact the business goal,” he says. The #marketing metrics we use are disconnected from the things that impact the business goal, says @randfish. He believes business is on autopilot when it comes to reporting, pointing to preconceived ideas as a culprit. “I think it happens because marketers are used to certain metrics. Their managers and CMOs and even CEOs are used to certain metrics; they’re used to reporting in a certain way,” Rand says. A one-size-fits-all metrics mentality for content evaluation is wrong. It’s situation-specific, says @RandFish. Rand says content marketers run into problems when they assume some metrics are good and others are bad. “It’s all situation-specific and tying the metrics to business goals is what we need to do,” he says. Develop a content marketing strategy with defined marketing objectives and success measurements. Produce original, high-quality content aligned with those objectives. Publish to online and offline channels identified in your strategy. Distribute content, via your email database, social media, and PR. Amplify your content using SEO and SEM to find those you don’t know or who don’t know about you. Measure results against business goals. Refine strategy to improve results. Rand is right. What you measure must relate to the first thing in the cycle – your business goals. Yet, most content marketers focus on reporting the success of distribution and amplification efforts. This results in an overall lack of accountability to the business. It’s easy to become distracted by the process of content marketing because data gives a great way to see results. It’s exciting to tweak a project and see metrics change, rankings shift, or follower numbers increase. The gamification of social media turned us into an industry of tracking fiends – while distracting too many of us from the business outcomes we should be trying to achieve. Activity metrics: Gobs of statistics – including impressions, reach, views, sessions, and engagements – are reported for websites, social media, and online advertising covering both organic and paid traffic. Big activity numbers can seem good, but they don’t necessarily help determine if you’re meeting business goals. It’s a little disingenuous to pay Google to promote your content or website, then turn around and claim success. Time spent: Does more attention on Facebook, YouTube, Pandora, and any other online channel or platform convert to more business? Too many marketers make the pivot into content designed purely to entertain for the sole purpose of holding attention longer. Will that compilation of cheesy ads from the ’80s coax a person to make a purchase? Will those oh-so-clever memes lead to more newsletter sign-ups? Will people notice or care which company page or account the content came from? Sentiment scores: These might reveal how people feel about your content, but do they make a difference to your bottom line? Sentiment may help you set the right tone, but it’s a long way from proving the effectiveness of your content. What is your purpose? What does profitable customer action look like for you? What can be measured to ensure that your efforts are appreciated and rewarded with buy-in from your business? Profitable customer action most resembles growth in the business. One of the most misunderstood metrics is unique user views. Reaching 100% of your audience is difficult, if not impossible, so tread carefully before reporting you’ve reached everyone. Before you claim victory to your management team, it’s worth knowing how unique users work. Unique user views are designed to count visitors to your website, but it’s not an exact science. In simple terms, a new user is counted on the first visit to a website. If a person uses more than one browser – say Safari and Chrome – the user is counted twice. Or, if cookies are in play and the user clears their cookies or the cookies are reset, the same person could be counted more than once during any given period. Improvements are made continually and the rules defining unique users keep changing. Most recently, Google has started trying to predict and filter out duplicates for people visiting your website from more than one device. It’s vital to define business goals in your content marketing strategy along with how you plan to measure goal achievement. This creates a good opportunity to get buy-in from elsewhere in the business because the important measurements are not going to come from Google Analytics. You’ll need support from different departments to get assistance on reporting. Sales data is the motherlode of all measurement. If you can prove content marketing is impacting the bottom line, you’ll have no problem getting more budget for future efforts. New customers are another critical measurement. Identifying the influence content has on customer acquisition – and you should be considering ways to capture that information – shows the value of content marketing. Average customer lifetime value reflects how content marketing aids upselling and cross-selling opportunities. Benchmark this figure and track it as part of your management reporting. Reduction in the cost of customer acquisition shows your content marketing can lower expenses in other areas of the business including advertising, traditional marketing, and sales. Customer retention and loyalty demonstrate the value of content marketing since it’s cheaper to keep a customer than find a new customer. Leads generated measures the number of potential revenue opportunities created for your company by tracking the leads directly resulting from your content. Email subscribers rank at the top of the subscriber hierarchy, according to Joe Pulizzi and Robert Rose in their book Killing Marketing: How Innovative Businesses are Turning Marketing Cost into Profit. This is because the audience has not only shown an interest in your content but expressly requested more of it. When someone wants your content, it’s much easier to convert that person into a paying customer. Goal attainment in Google Analytics depends on the goals set up by your SEO team and can help track the effectiveness of your content and how well your calls to action are working. Click-through rates (CTR) from website and email identify a willingness to answer calls to action or find further information. It’s essential to understand how customers move through your content – where they enter and drop off – but high CTRs don’t necessarily equate to conversion. Time spent demonstrates your content is interesting, but it doesn’t show whether it’s meeting business goals. Still, if time-spent figures are changing, it’s worth examining why. Invitations to contribute at in-person events, in writing, or by making appearances on videos or podcasts are an indication your content is positioning you or your company as subject matter experts. Results from research and surveys about your company provide a body of information to track over time. Depending on the questions asked, you can ascertain whether your content efforts are having a positive effect on your business. Rand explains how web analytics can lead to bias in marketing’s expectations. Consecutive monthly reports showing increased activity, time spent, and improved sentiment create a false sense of security. Because content marketing is known for taking time to build momentum and deliver results – six, 12, or even 18 months – focusing on the wrong measurements creates a difficult situation if the business hasn’t changed despite all the reports delivering good news for months. The less that marketers and management understand analytics and metrics, the more likely that frustration levels rise until a growing sense of “content marketing doesn’t work” creeps into the psyche of the business. That’s exactly what’s happening in this era of too much information. Switching to business metrics for measuring and reporting the effectiveness of content marketing requires a shift in thinking. Content marketers who report on the impact content has on the business are better placed to gain influence in their organization. 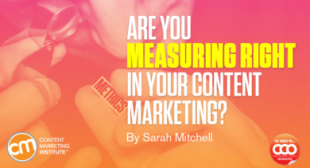 The post Are You Measuring Right in Your Content Marketing? appeared first on Content Marketing Institute.